The following pruning shears have been selected by us to offer professionals and expert gardeners alike, the opportunity to use good quality pruning shears without spending large amounts of money. 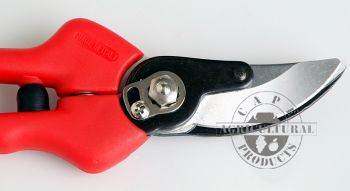 We introduced this pruning shear into the South African vineyard industry during the 2005 pruning season for some trials and received favourable feedback from professional users. The CAP900 pruner offers you a very comfortable plastic grip together with a sturdy, thick blade - something that is often missing from more affordable pruning shears. However, the affordable price does not mean that we have sacrificed quality. Over the last 12 pruning seasons we have found that the demand for this pruner has exceeded all our expectations - professional users that are looking for a pruner that fits between the poor quality that is often sold as "professional", and the high quality of the ARS, Bahco and Felco pruning shears that we also offer, have been very impressed with the performance. A simple locking system means you can keep the tools properly adjusted for better cutting performance. Another benefit of this tool is that there are spares available to help you maintain it. 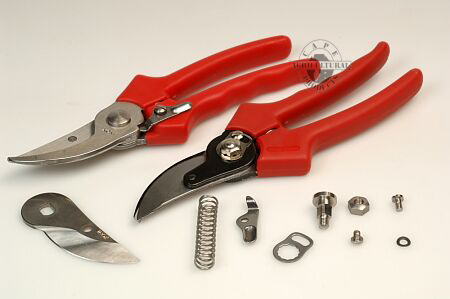 We have selected this pruner for its comfortable handles and light feel. This shear is a simple, "no nonsense" pruner for light duty work around the home, propagation, and for harvesting flowers. A simple, effective locking mechanism results in the shear remaining open and not locking by "accident" while in use. This, together with the coil spring that does not accumulate dust, ensure that your productivity is at its peak. If you are looking for a pruning shear that is basic, yet offers a blade that can cut branches in the vineyard or fruit industry then our solid metal pruning shear is just for you. We have introduced the pruner for users in the professional market that are looking to save money on equipment, but cannot afford to use low quality pruners that do not stand up to rigorous use. 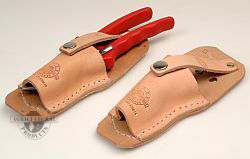 Tough and virtually unbreakable, the pruner has a simple leather closing strap and can be sharpened repeatedly. They have been used succesfully in the citrus industry as well as landscaping and garden services. Spare springs as well as centre bolt and nut sets available. 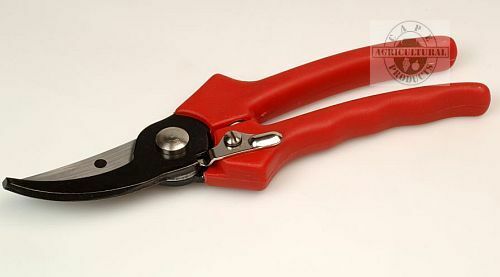 Cape Agricultural Products offers high quality holsters to protect your pruning shear when it is not in use. Made from high quality leather, with a leather strap and press stud to hold the shear in place, they are available in 2 variants, one with a belt loop and the other with a belt clip. Click here to view a more detailed picture of the loop and clip. To prune successfully a pruning shear's blade needs to be kept sharp. Use the Bahco SHARP-X sharpening tool to keep the blade in good condition. The tool is equipped with 2 Tungsten carbide bits that will give many years of use. The 2 component handle makes it comfortable to use. You no longer need to add a liquid such as oil, water or diesel so the sharpening of knife blades is a pleasure.